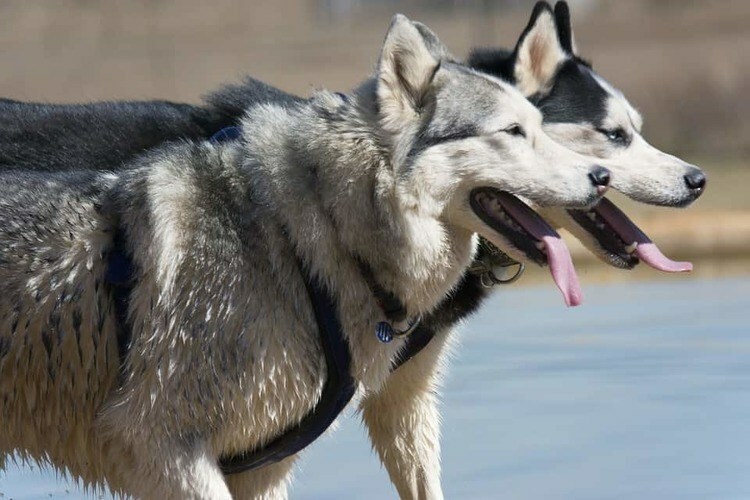 You are at:Home»Husky Guides»Husky vs Wolf: What Are The Differences? Husky vs Wolf: What Are The Differences? But while huskies and wolves are often mistaken for one another, they are actually two totally separate breeds of animals. Some people find it hard to distinguish husky and wolf differences, and to be honest, we can’t blame them. They are very similar and even have some shared ancestry so it’s no wonder why they cause such confusion. However, a husky is a dog and a wolf is — well, a wolf in dog’s clothing! We’re going to discuss the differences of huskies vs wolves and highlight the similarities between these beautiful furry creatures. Is a Husky a Wolf? While husky dogs are descended from wolves and still maintain their distinctive looks, they aren’t actually wolves. That said, studies show that huskies share an unusually large number of genes with ancient wolves, so we can forgive you for wondering, is a husky a wolf? Unlike a wolf, a husky is a domesticated animal and, although related, the two are completely different species. Huskies originate from Siberia and were developed by the Chukchi people of North Eastern Asia who used the dogs for sledding and to assist them with hunting. The Siberian hunting people relied on huskies to pull their light loads at moderate speeds over long-distances through the Siberian Arctic, home to one of the most inhospitable climates in the world. Huskies were given relatively little food in return but were highly valued by their tribe. By now, you’re probably thinking — if they aren’t the same animals, then why do huskies look like wolves? They certainly are very similar. For starters, both huskies and wolves are covered with thick fur to help them survive in cold environments. Both have the double coat of fur that helps keep them warm and insulated in bad weather — no wonder when they both originate from such cold climates! Obviously, their face shapes and markings are incredibly similar too, which is probably one of the main reasons why people find it hard to tell the difference between the two. But there are some noticeable differences. Huskies can have a white, black or brown coat while wolves generally have greyish white fur. Also, wolves have slightly different paws, as they have been adapted to walk on various terrains. All wolves have varying shades of yellow eyes and heads that are much larger in comparison to their body size, which you won’t find on a husky. Long teeth enable wolves to be effective hunters in the wild, and they can also reach a huge 200lbs in weight! Apparently, wolves are highly intelligent and have bigger heads to support their big brains. Although huskies are one of the more intelligent dog breeds, they’re not quite so brainy as their wolfy ancestors! And while huskies are certainly quite big dogs, the wolf is actually the largest animal in the canine family. When you compare the behavior of a wolf and husky, they are very different. The biggest difference being that huskies are domesticated animals and are therefore much friendlier than wolves. When people have tried owning and taming a wolf, they’ve often found that it reaches maturity and becomes independent at a young age, leaving the human with no control over the animal. Huskies are pack dogs too, but do fit in easily to a human family structure (especially if they have a strong, alpha owner). Huskies are strong and energetic, just like wolves, but they are more playful and need room to run and lots of exercise. They are actually still used as working dogs in colder parts of the world today and still pull sleds in the likes of Siberia and Alaska. Lastly, unlike other dog breeds, huskies howl whereas wolves signal with loud howls and barks. As you can see, while there are some similarities between them, there are a number of husky and wolf differences that show they are, in fact, very different animals. One of the most common questions we hear is, who would win in the battle of huskies vs wolves? Check out this awesome video to find out!